It’s been a few years since my last post on a deli and in that time I’ve been pacifying myself with half hearted Sysco sourced Reubens and the occasional slice of pepperless, insipid pastrami. Recently, my pining for the true deli experience was worsened by a shipment of sublime bagels, blintzes, pastrami, brisket, and spreads from my friend Merry and her family’s Florida deli. Fortunately, there have been signs of promise in the Deep South, namely the opening of The General Muir in the Druid Hills neighborhood of Atlanta. With promises of glistening matzo ball soup, homemade bagels, and pastrami poutine, it didn’t take much convincing from Jennifer for me to make the drive from Brookhaven to The General Muir. Typically late March is full of pleasant, sunny skies and the not so distant promise of blistering hot summers, but this March was an exception. 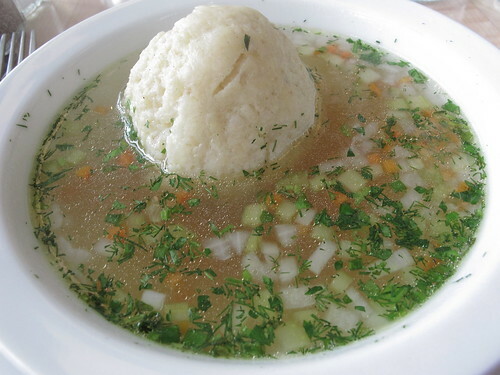 With flurries filling the sky, it was still the weather for scarves and overcoats not to mention a steaming bowl of matzo ball soup. 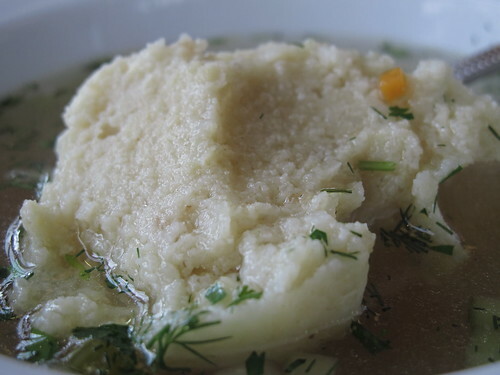 Often times I’ll find that matzo ball soups are either a single matzo ball floating alone in a bowl of broth or a matzo ball lost in a sea of chunky vegetables and dry shredded breast meat, The General Muir aims for a comfortable middle ground. By itself the broth is thin but the glistening globules of fat give a delightful lip smacking texture. Adding interest and body is a medley of celery, onion, carrot, and dill, the result is a soup that is nicely seasoned and a bit vegetal. 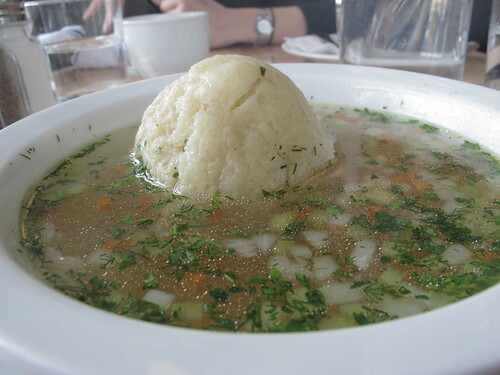 As for the matzo ball, this was a airy and fluffy specimen and far from the heavy as a stone examples that some delis offer. 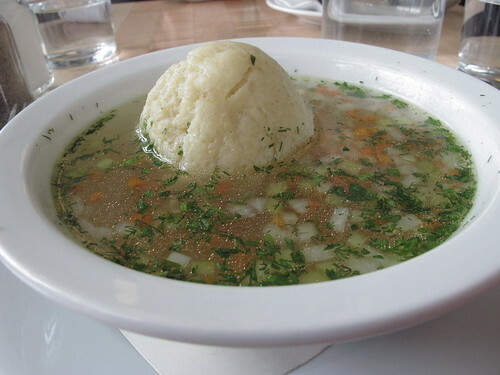 Perfect for a cold, light in texture, and well suited to the broth, this matzo ball soup didn’t feel too substantial but it offered plenty of comfort for the chilly spring day. 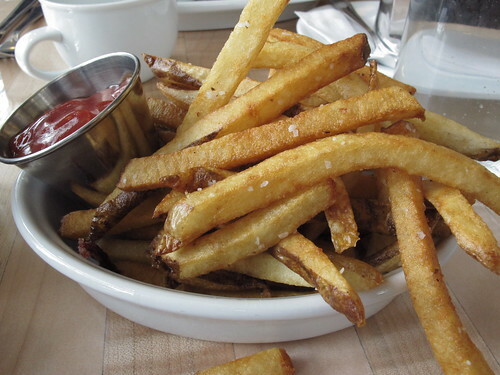 With pastrami on rye on the way, the side of fries arrived first. Sadly, the pastrami poutine would have to wait for another day but this order of fries gave an inkling of my next visit to The General Muir. 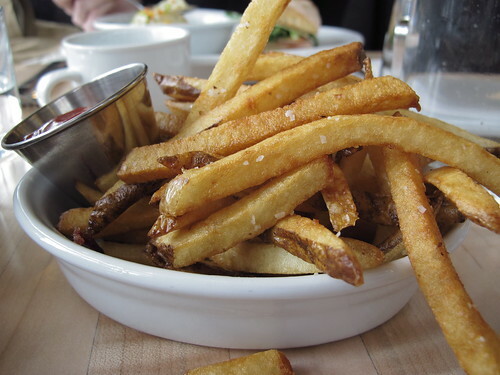 Grains of salt aside, there were a few crispy ends on these fries and a fair amount of textural contrast but I couldn’t help but wonder if they were hearty enough to hold gravy, cheese, and pastrami? So just how does the featured pastrami stack up? 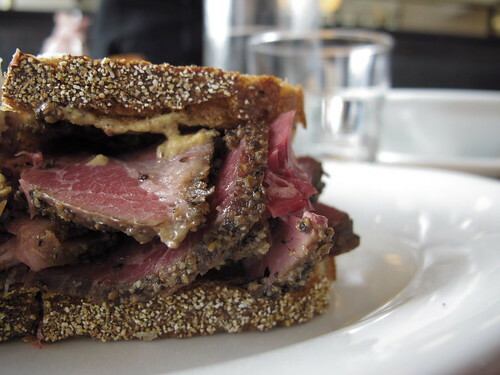 From the beginning, this is sandwich simplicity: meat, mustard, and rye bread. 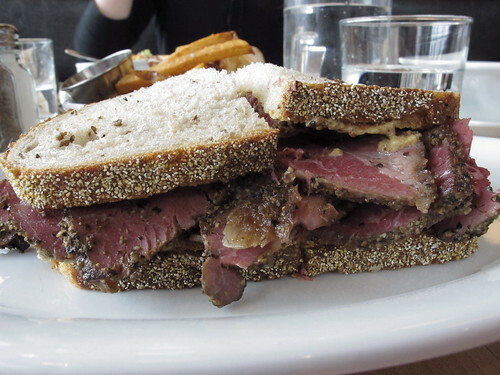 While the pastrami doesn’t look too heavily peppered, each bite begins with a salty beefiness that gives way to a definitive peppercorn punch. 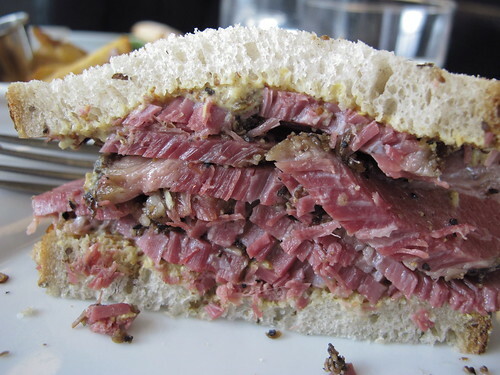 If there is a weakness to this sandwich, the rye is a bit listless compared to my favorite hearty rye breads of Zingerman’s Deli in Ann Arbor but it makes an excellent vehicle for grainy mustard and the exceedingly tender, fatty, and bristling with salinity pastrami. On the whole, this is a fine example of the breed and I can only imagine how it works on top of poutine. Maybe after my next trip to Atlanta I can attest to the quality of The General Muir’s breakfast, pastrami poutine, or if the burger that chef Todd Gingsberg popularized at Bocado survived the trip. However, based on this first look at The General Muir, I’m pretty sure that Goldberg’s is no longer my go to deli in Atlanta.